South African President Jacob Zuma (R) and Winnie Mandela (L) attend a celebration ceremony ahead of the 105th Anniversary of African National Congress (ANC) in Soweto, South Africa on January 06, 2016. The ANC’s support slipped more than 8 percentage points to a record low of 54.5 percent in local government elections in August, with the party ceding control of Johannesburg, the capital Pretoria and the southern port city of Port Elizabeth to opposition coalitions. 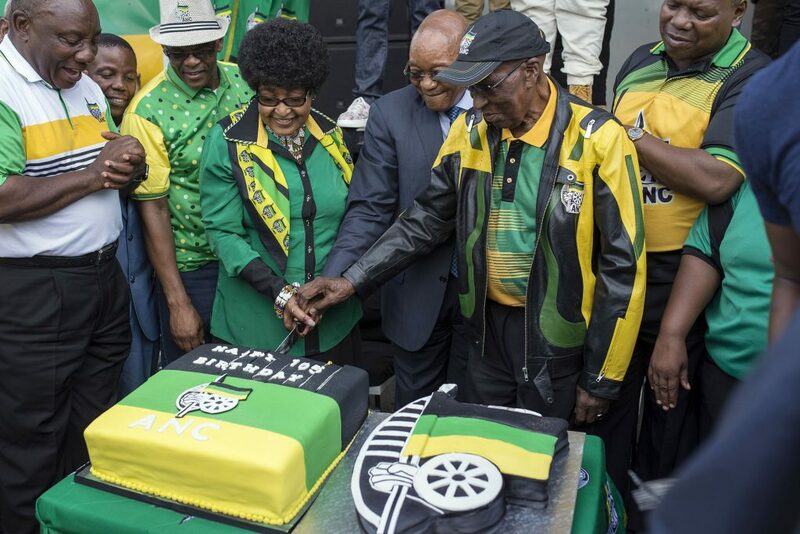 Voter disenchantment has centered around Zuma, a 74-year-old former intelligence operative whose second five-year term as ANC leader is due to end in December this year. Zuma has faced calls to resign since the Constitutional Court ruled in March that he violated his oath of office by refusing to repay taxpayer money spent on his private home. A campaign to remove him gained impetus on Nov. 2, when the graft ombudsman released a report suggesting that he may have breached the code of ethics in his relationship with members of the wealthy Gupta family, who are his friends. It detailed allegations that the Guptas may have influenced the appointment of cabinet members and received special treatment for a coal business linked to the family and Zuma’s son, Duduzane.